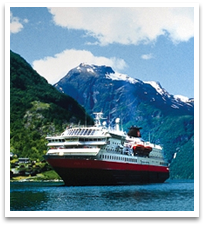 Hurtigruten cruises (formerly Norwegian Coastal Voyages) evolved out of the need for dependable transportation along Norway’s western coast. During the 1900’s the coast had few lighthouses and limited marine charts, thus navigation was difficult and any transportation of goods and services was curtailed by conditions, especially in the winter. Norway’s national steamship advisor called for a change, and Captain Richard accepted the challenge. He and his crew methodically documented their travels along the coast and used this wealth of information to provide access and communications to many otherwise isolated Norwegian communities.